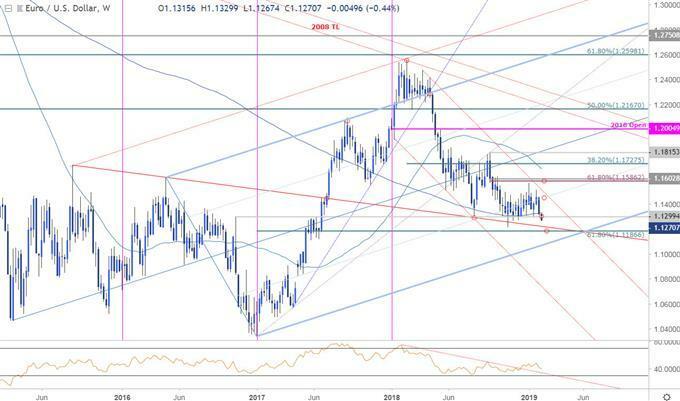 (MENAFN - DailyFX) Updated weekly technicals on EUR/USD - price at risk for further losses sub-1.13 Check out our 2019 projections in our Free DailyFX EUR/USD Trading Forecasts Join Michael for Live Weekly Strategy Webinars on Mondays at 12:30GMT In this series we scale-back and look at the broader technical picture to gain a bit more perspective on where we are in trend. Euro has fallen more than 1.7% against the US Dollar since the start of the year with price now threatening a critical support zone we've been tracking for months. These are the updated targets and invalidation levels that matter on the EUR/USD charts. Review this week's Strategy Webinar for an in-depth breakdown of this setup and more. EUR/USD Weekly Price Chart Notes: In last month's EUR/USD Weekly Technical Outlook we noted that price was approaching confluence downtrend resistance at 1.1586 with a breach above needed to validate a technical breakout. Euro registered a high at 1.1570 before pulling back with the decline now threatening a break below critical support at the 1.13-handle. Bottom line: We're looking for a weekly close below the figure to validate a break of support targeting fresh multi-year lows. From a trading standpoint, EUR/USD remains at risk for further losses while below 1.13 a good place to lower protective stops but fresh shorts from here are not favored and I'll be on the lookout for a near-term exhaustion recovery to offer opportunity. I'll publish an updated EUR/USD Price Outlook once we get further clarity on the near-term trading levels. EUR/USD Trader Sentiment A summary of IG Client Sentiment shows traders are net-long EUR/USD - the ratio stands at +2.79 (73.6% of traders are long) bearish reading Traders have remained net-long since February 4th; price has moved 1.4% lower since then Long positions are 12.5% lower than yesterday and 15.4% higher from last week Short positions are 35.1% lower than yesterday and 58.6% lower from last week We typically take a contrarian view to crowd sentiment, and the fact traders are net-long suggests EUR/USD prices may continue to fall. Traders are further net-long than yesterday and last week, and the combination of current positioning and recent changes gives us a stronger EUR/USD-bearish contrarian trading bias from a sentiment standpoint See how shifts in EUR/USD retail positioning are impacting trend- Learn more about sentiment! Relevant EUR/USD Data Releases Economic Calendar - latest economic developments and upcoming event risk. Learn more about how we Trade the News in our Free Guide !